Benchmarking your graphics card is a great way to quickly and easily see how well your GPU will cope with a variety of graphical demands and effects. A good graphics card benchmark will put your GPU through its paces, and the results will paint a good picture of what your graphics card can and can't do well. It means when a brand new game is coming out with stunning graphics, you can buy it in full confidence that your rig will be able to run it well. With these results you can then look at tweaking the game settings so that you might sacrifice some graphical bells and whistles, but you'll get a smooth and playable frame rate as a result. If you've just bought a beast of a graphics card then benchmarking it (and the high scores it produces) can give you bragging rights over your friends, and that's always nice. Because GPU benchmarks throw a number of intensive graphical tests at your GPU, it's a great way to see how your graphics card performs under load. If you've built your own rig, or overclocked your graphics card to eke out more performance, than running a benchmark for a few hours can give you confidence that your GPU is stable. The last thing you want in the middle of a game is for your graphics card to fail, so running benchmarks can catch any problems early on. If it can run them for hours on end without problem you're good to go. If there are crashes, artefacts or other graphical glitches then you can begin working out what the problem is. One of the most likely culprits will be a GPU getting too hot, so if your graphics card fails to run a benchmark, it might be worth making sure it's getting plenty of cool air. When it comes to choosing software to benchmark your graphics card you're spoiled for choice. There are a number of popular benchmarking suites available that can put your graphics card through its paces. Not all of them are free, however, such as the popular 3DMark benchmark. There is a free version ( but the options are limited. For a free version which still comes with enough settings to properly test out your graphics card we'd recommend going for Heaven Benchmark. Scroll down the page until you see 'Download now'. Click the link, and then select where you want to download it from. Once installed, run the program. A window will appear letting you select various options, such as the texture quality and the resolution you want the benchmark to run at. When choosing the resolution it's best to run the benchmark at the resolution you usually run games. That's the resolution you run Windows in as well (such as 1920 x 1080), then select 'System'. If you fancy testing out how well your gaming rig will cope with stereo 3D such as Nvidia 3D vision, you can enable 3D as well. If the benchmark runs well without any crashes or major framerate drops then you're good to grab a pair of 3D glasses and get gaming. If you're not sure about what settings to use, there are a couple of ready made presets that will help you get benchmarking quickly and easily. Next to where it says 'Presets' click the drop down box and choose either 'Basic' or 'Extreme'. As you can guess, Extreme will really push your graphics cards to the limit. Will your GPU be up to the task? When ready press 'Run' to begin the benchmark. When the Heaven benchmark runs you'll see a number of attractive 3D environments with the camera panning over them. This is a handy way to see how well your GPU handles this level of graphics. Just with your eyes you should be able to make out any dropped frames, graphical glitches or tearing. If the benchmark doesn't run smoothly then you already know that your graphics card is going to struggle with certain graphics. On the top right-hand corner of the screen you'll see and FPS (frames per second) counter which gives you a lot more information. For a smooth gameplay experience you'll want that counter to sit around at least 30. Any drops below can result in your games feeling slow and choppy. The higher this score the better, and ideally you'd like to see it at 60FPS. If your graphics card is struggling here, try changing the settings in the Heaven Benchmark settings page. This area will also tell you about your GPU including the model and memory. It will also record the temperature of your GPU – pay close attention to this as high temperatures can mean your GPU is struggling. An overheating GPU can also lead to problems and system instability. To begin recording the results of the benchmark, click 'Benchmark' on the top-left hand side of the screen or press F9 on the keyboard. Heaven will now run a number of tests and then display your results in a new window. These results with give you your average, min and max frames per seconds along with a score. The higher the score, the better. There's no quick way to compare scores with other people, but there are plenty of websites such as TechPowerUp and Overclock.net that feature message boards dedicated to discussing Heaven benchmark results. If your graphics card isn't getting the score you hoped for, there are a number of things you can do to improve the score before you resort to ripping out your GPU and replacing it with a newer model. First of all you should make sure have the latest stable drivers installed for your graphics card. 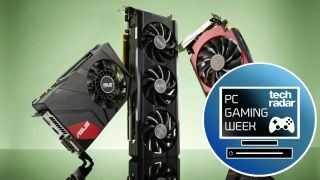 You can check this by either going to the website of your graphics card manufacturer, or using a program such as GeForce Experience for Nvidia cards to check that you're running the latest drivers. If you are using experimental or beta drivers it might be worth rolling back to the last official stable release. Once done restart your computer and wait two minutes for all the start up programs and services to launch. Close down any open programs once Windows has restarted and re-run the benchmarks. If you're still not happy, there might be another reason for the issues. Try opening up your PC and make sure that it is dust free and well ventilated, as overheating graphics cards could be the cause of poor performance and low benchmark scores. Clean the insides carefully with compressed air and a light brush. If that doesn't work, upgrade!